We are honored to recognize four local First Responders as “Hometown Heroes”. They are the first to respond to a fire, police matter or medical emergency and help keep our community and state safe! 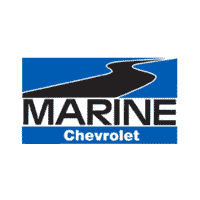 Thank you from Marine Chevrolet Cadillac and the North Carolina Automobile Dealers Association. These four First Responders were recognized at a recent ceremony and were nominated by their respective agencies. Brandy Bruns was hired with the Jacksonville Fire and Emergency Services on July 6, 2010. Since her hire, she has excelled in her duties and has been promoted up through the ranks. 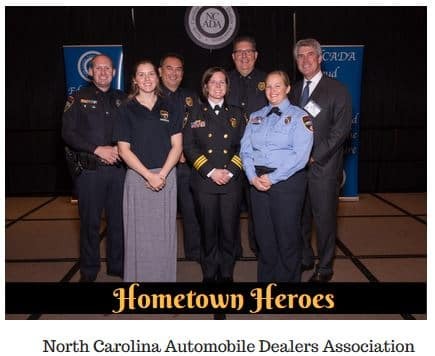 In 2014 Brandy and her team were recognized by the City of Jacksonville with an Extrication & Rescue Award for their part in providing exemplary care and customer service to a patient who had been critically injured and entrapped in a vehicle accident. Bruns’ other official and most important title is that of mother for her three children Cody, Bailey and Kiley. Because of her dedication, perseverance and leadership at Jacksonville Fire & Emergency Services Brandy Bruns was selected as the Jacksonville Fire & Emergency Services Firefighter of the year. Alex Tremain began his career with Onslow County Emergency Services as a volunteer with Jacksonville Rescue Squad in Onslow County. He worked his way through the ranks and was employed with EMS as a Paramedic Trainee and obtained his paramedic credentials in 2012. He has shown himself to be a professional and caring provider who believes in educating the paramedics he works with. He has shown himself to stand out as a leader and is respected by all his coworkers. He assists with the training and orientation of new employees to the division of EMS. He heads up projects within the Division of EMS to investigate assessment tools and treatments that improve patient care. Corporal Scott Alan Eichelberger with the Jacksonville Police Department Traffic Division is nominated as Law Enforcement Officer of the Year 2016. Corporal Eichenberger is committed to highway safety and has taken a focused interest in the identification, removal and prosecution of impaired drivers from Jacksonville roadways. In 2013 Corporal Eichelberger successfully completed the Drug Recognition Expert training. Less than 1% of all North Carolina law enforcement officers are Drug Recognition Experts. He is truly head and shoulders above the rest. Corporal Eichelberger is the agency’s ‘go-to’ person for questions related to impaired driving and has built an excellent relationship with the D.A.’s office. While not on duty he enjoys spending time with his son Ian and his fiance Camille. JPD Telecommunicator of the Year 2016 nominee Ciera Cravens has been a telecommunicator with the Jacksonville Police Department since May 2015. When not working 12 hour shifts in the city’s 911 center, Ciara keeps busy working towards a Bachelor’s Degree. She has studied Arabic, Spanish and Sign Language and is certified to teach English as a Second Language (ESL). Her educational focus area is forensic linguistics which she hopes to use to analyze interviews and speech patterns in criminal cases. She has exhibited adaptability and a keen willingness to learn new things and does her best every shift to offer Jacksonville citizens the services requested. Her dedication to learning the difficulties of her position and her ability to ‘step outside the box’ and the 911 Center using language skills to assist officers maker her worthy of the nomination. Ciara is known as a dispatcher who keeps callers calm during ‘the worst experiences of their lives’.